Jacob Stockdale just can't stop scoring. The Ulster wing entered today's game against England off the back of three consecutive braces against Italy, Wales and Scotland and just before half time, England felt his try-scoring wrath. Stockdale made a burst down the left wing and although he couldn't collect his chip kick over the line, he was able to pounce before any defender after the ball bounced off his knee. The crucial score represented his seventh five-pointer of the championship, which is a new Six Nations record. 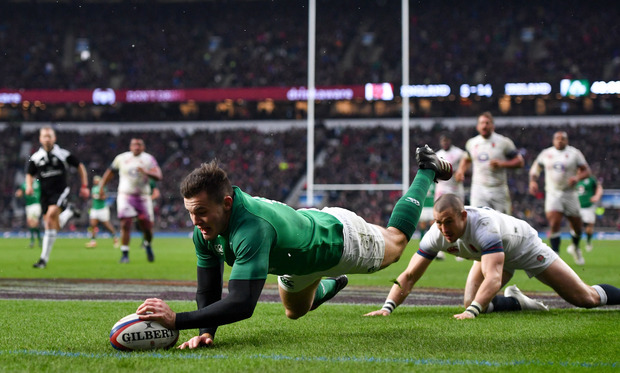 At just 21, the youngster has become one of Ireland's most prolific every try scorers. He now boasts 11 tries in just nine tests.